Somer Gauthier knew the ACE training had worked when one of her general managers told her about an irate customer. Gauthier connected with Tina Eblen of ChildWise Institute; six months later, her general managers received ACEs and resiliency training. One manager remained skeptical. “In her eyes, ACEs were an excuse [for workers] to not perform at the level we wanted them to perform,” Gauthier said. But a few weeks later, that same manager came to Gauthier to explain how she’d reacted to an angry male customer. That, she said, is why business owners should care about ACEs. Gauthier’s co-panelists—MARC advisor Melissa Merrick, a behavioral scientist at the Centers for Disease Control and Prevention; Scott Hall, a senior vice president at the Greater Kansas City Chamber of Commerce; and Anne Jesko, vice president for human resources at the Wisconsin Economic Development Corporation (WEDC)—agreed that training a trauma-informed work force, from front-line staff to chief executive officers—is not only ethical practice but prudent business. Jesko works for the Wisconsin Economic Development Corporation, formed to attract and retain businesses in the state. The group was plagued by high attrition and steep costs for recruitment and training. “When I first learned about ACEs in spring of 2016, it wasn’t clear to me or my agency how we were going to make the connection. We’re not a direct-care agency,” Jesko said at the Summit. The steering committee of the Wisconsin Children’s Mental Health Collective Impact encouraged Jesko to apply trauma-informed practices to the WEDC itself. “We started with an article, then a TED talk,” she said. 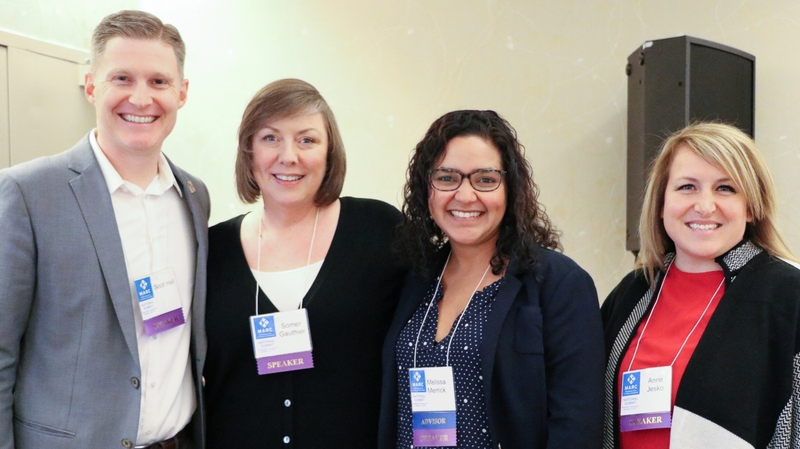 “Our staff started talking and asking questions.” Later there were bi-weekly articles in the WEDC newsletter—pieces on child abuse awareness, domestic violence prevention and ACEs 101. Hall, whose Chamber of Commerce partnered with the cross-sector network Trauma Matters Kansas City to create Resilient KC, said that sharing ACE science with people in the business world might require some translation. Employers may not be moved by slides about infant brain development, but they will surely be swayed by learning how trauma-informed practice can affect their company’s reputation, their workers’ wellness and their bottom line. Gauthier said the first ACE training in Helena was instructive for her as well as for her workers. For a second training to an audience of junior managers, leaders first established that the training was a safe and confidential space; then they leavened the science with personal stories. She said that trauma-informed thinking can unite business owners and social service providers, progressives and conservatives. “We all want the same thing,” she said. “We all want children to grow up in safe environments. We’re going to disagree on many things…but ACEs is a good starting point. It’s a scientific, factual study to get the doors open and the conversations happening.